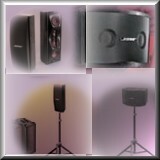 Hundreds of churches in the state of Texas have Bose® sound systems installed in their sanctuaries, gyms and schools. The buzz is that they are impressed with the clarity and high quality sound in Bose® Professional Products. Overdrive Productions takes the guess-work out of trying to figure out what you need by offering precise sound installation, state of the art audio engineering and great BOSE® Professional Products! ODP attends NSCA Expos to stay current on the latest in the audio-video industry. BOSE® and Overdrive Productions is a sound experience you will never forget. ODP offers both engineered sound (for those who want to achieve "life-like" sound) and portable sound (for musicians who need a portable sound system). Call Overdrive Productions to get a FREE ESTIMATE. We think you will be pleasantly surprised to find out that you can get 'Quality Sound' at a reasonable price. *Note: Bose® is not all inclusive of the professional audio products offered by Overdrive Productions. Portable Sound Products - Available for sale or rent at Overdrive Productions. Great For D.J. Gigs & Special Events! In order to provide our customers with the best sound installation possible, Overdrive Productions installers are professionally trained and Bose® certified.